My daughter absolutely loves these! They are so soft and easy to chew. It's really good as well as they are quite long so she can hold them. The only thing that's not so good is the fact that they are quite messy. They are so orange and it just gets everywhere! 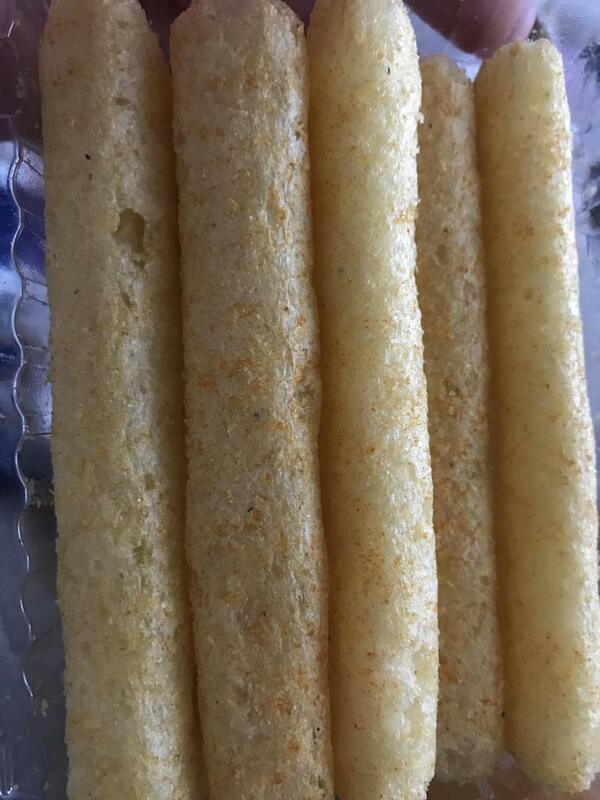 Our twins love these melty sticks, they are wonderful if we are out and about and fit perfectly in our changing bag! They are easy for babies to hold and melt in their mouths very easily so there is less worry about choaking. They come in several different flavours and our twins seem to enjoy them! Perfect little snacks for blw, good size for tiny hands and easily dissolve when baby eats! Isaac easily figured out how to eat these and enjoyed the flavour. These are the perfect size for babies, it's easy for there hands to hold a d encourage self feeding! My daughter would always want them. 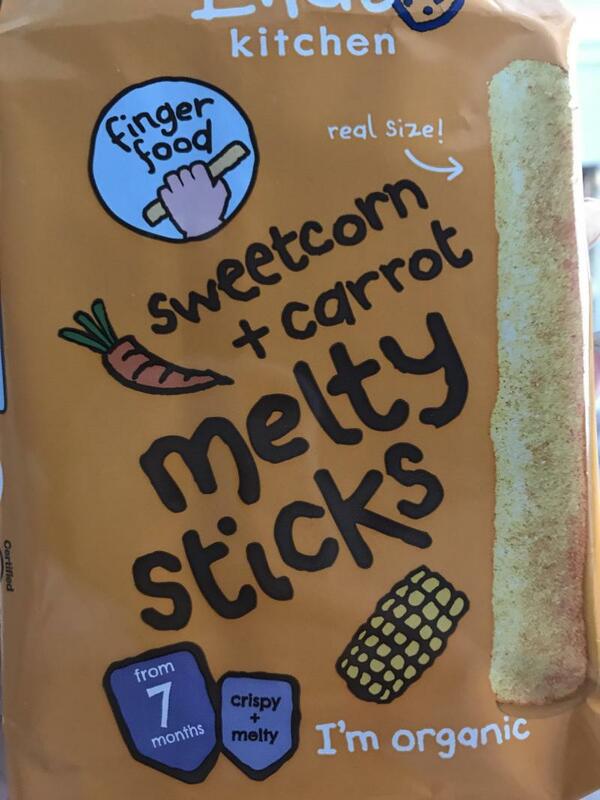 These melty sticks are a great product, my daughter absolutely loves them even now at 3 and a half! They was perfect to go with baby led weaning as she could easily hold these and being them to her mouth without problem. We enjoy a lot of the Ella's kitchen product and always have some in the change bag. It wont be long until her sister can enjoy all the yummy treats there are available now! Would reccomend this product to any one with children. My daughter loves it as it is easy to have as finger food, it's healthy snack and most importantly it's taste great. They melt in the mouth so safety, which is good as small ones sometimes struggle with new foods this one is no problem. Good value, healthy option and my baby loves them! One bag will last me a few days, so even better value for money! They are a good size for small hands and she loves being able to feed herself. They are so light and fluffy they pretty much just melt in her mouth, which makes me feel more at ease whilst introducing her to new foods! My daughter loves it! They are very easy to hold it in hands, easy to eat... They are melting and is no risk to choke! We bought it first time because we saw that they are organic and because Tesco run a deal "buy 3 and pay 2"! We found them in different flavour which is very nice because my daughter love to try different thigs! I highly recommend them! Definitely in love with feeding journey. I’m so happy that we can enjoy lovely food. Waiting for some more!! We love everything what is from 4 months . Up. Tried these for on the go and snacking at home and the twins love them. They are the right size to encourage self feeding but can be very messy. My Little one can not get enough of these! With finger food being quite hard for younger years these tick all the boxes! Nice shape for little fingers to grip and hold whilst being a healthy convenient snack. As a first time mum I was worried about choking but these do exactly what they say and melt which my boy loves! by far his favourite snack which he would eat the whole pack if I let him! Healthier crisp that kept my daughter happy when teething and just enough flavour. It would be nice to buy in multipacks rather than individual packs as soon adds up. Overall I found these to be perfect as a snack especially when my daughter started trying food. They soothed the gums when teething as she was able to bite down on them and they are over bearing in flavour and certainly healthier than your standard crisps. My little one loved these. Great light airy snack. Not alot of salt in which is great. Easy to hold perfect for when little one starts holding own food. 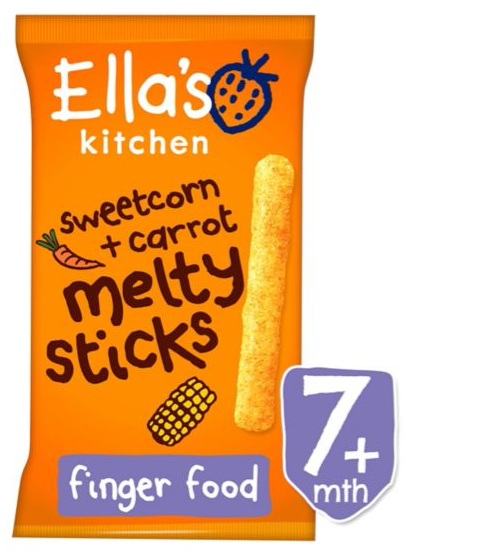 The Ella kitchens carrot and sweet corn melts sticks are amazing an easy finger food to give for babies learning how to grab and for on the go.They break down easyily for littles ones to digest. Another plus for this product is that it’s organic so you can rest that your not giving your baby rubbish. My 3 year old daughter still loves these as a snack and has since about 12 months old. They are a decent sized snack. They are just very messy!! Only weakness I could give is not enough in one packet! Very easy to eat as they just melt in the babies mouth, I have never had to help my baby eat them and she has never gagged/chocked on one. Would 100% recommend to anyone! My son loves eating these especially when he is teething bad. They smell and taste nice. He eats the whole pack and wants more. That’s how good they are. Perfect little snacks for when on the go or even between meal times at home. They taste delicious and are easy to hold for them tiny little fingers. They come in different flavours and are perfect to fit in your bag. This is a great quick easy snack thats both my kids enjoyed as babies/toddlers. Can get abit messy with the orange colour but adds to the fun. Love this product when you are on the go (or not on the go) its a quick easy snack for lil ones and for me alot of other baby snacks which have alot of sugars that your lil ones do not need. They melt in the mouth so safety rating is good to avoid choking as small ones sometimes struggle with new foods this one is no problem. 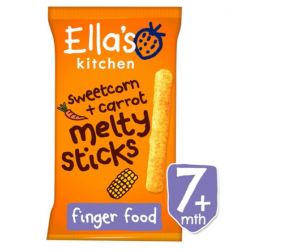 Ella's Kitchen Sweetcorn + Carrot Melty Sticks 7m+ are organic sweetcorn + carrot maize sticks, perfect for snacks.